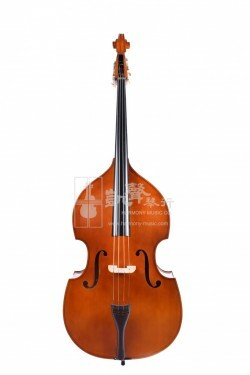 Our Most Popular Double Bass for Beginners. Offers full, rich sounds, without the harshness of other beginner instruments often pertain, Aiki T Series Double Bass is designed in a Gamba shape that is ideal for players to practice their techniques and master higher positions. This sturdy laminated bass is not only pleasing to hear, the Aiki T Series Double Bass is also crafted with seasoned laminated woods, as well as a smoothly carved bridge and a functioning machine-head. Comes with rosin, bass bag and student horsehair Bow, each Aiki T Series Double Bass is adjusted carefully by our skilled technicians to ensure the different aspects meet our specialized quality standards. Available in the following sizes: 1/16, 1/10, 1/8, 1/4, 1/2, 3/4. Smaller sizes are also available, feel free to email us at info@harmony-music.com for more information. Established since 1989, Aiki has been providing quality Basic Music instruments and Accessories that anyone can enjoy and use, at a price that you do not have to break your wallet on. No music interest should be diminished from a poor-performing instrument, that is why Aiki creates starter musical instruments that are decent sounding, with dynamic contrasts, and you can play with ease.